Put this layout XML file into your Android project’s /app/src/main/res/layout directory and name the file my_toast.xml . The RED TextView control has no specific settings configured. By default, this control will be drawn in the upper left-hand corner of the parent layout. 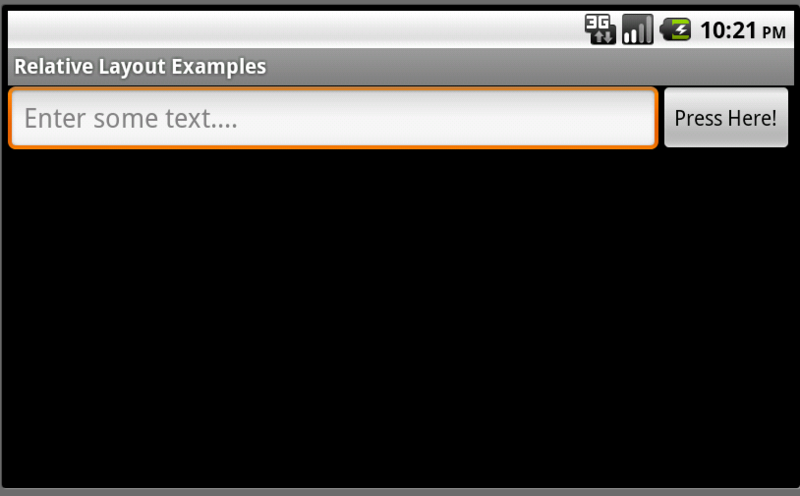 The ORANGE TextView control is centered horizontally in the parent layout. Because all controls default to the top left-hand corner of the screen, this effectively anchors the control to the top middle edge of the parent layout. The YELLOW TextView control is aligned to the right-hand edge of the parent layout. Because all controls default to the top left-hand corner of the screen, this effectively anchors the control to the top right corner of the parent layout. The GREEN TextView control is centered vertically within the parent layout and configured to display to the left of the BLUE TextView control. The BLUE TextView control is aligned to the center (horizontally and vertically) of the parent control. This displays it in the middle of the screen. 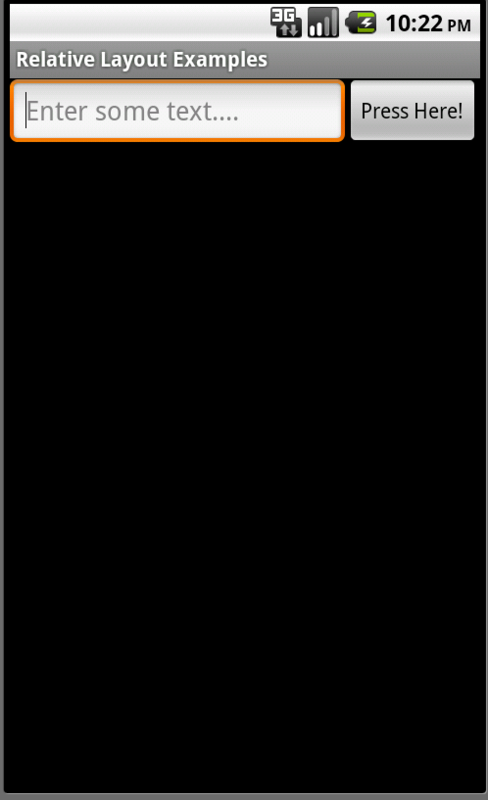 The INDIGO TextView control is centered vertically within the parent layout and configured to display to the right of the BLUE TextView control. 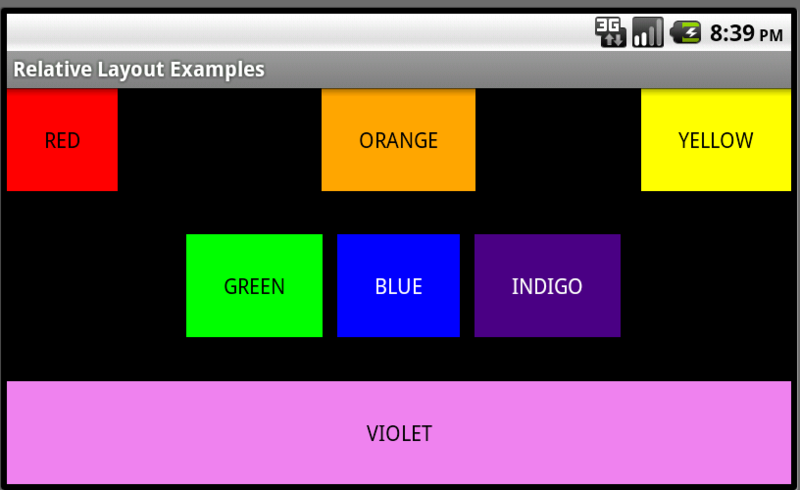 The VIOLET TextView control is aligned to the bottom edge of the parent layout. It’s width is also set to fill the parent, allowing it to stretch across the bottom edge of the screen. Keep your relative layout rules to a minimum. This helps reduce the chance of circular rules and makes your layout more manageable and flexible. As usual, remember to test that your layout design works as expected in both portrait and landscape modes, as well as on different screen sizes and resolutions. Use relative layouts instead of nesting linear layouts to improve application performance and responsiveness. It is also worth noting a few constraints regarding resources. First, Android supports only a linear list of files within the predefined folders under res. For example, it does not support nested folders under the layout folder (or the other folders under res). Second, there are some similarities between the assets folder and the raw folder under res. Both folders can contain raw files, but the files within raw are considered resources and the files within assets are not. Note that because the contents of the assets folder are not considered resources, you can put an arbitrary hierarchy of folders and files within it. This tutorial describes how to use the ListView view together with Activities and Fragments in Android. The tutorial is based on Eclipse 4.4, Java 1.7 and Android 5.0. The display of elements in a list is a very common pattern in mobile applications. The user sees a list of items and can scroll through them. Such an activity is depicted in the following picture. Typically the user interacts with the list via the action bar, for example, via a refresh button. Individual list items can be selected. This selection can update the action bar or can trigger a detailed screen for the selection. The following graphic sketches that. On the selection of a list item another activity is started. Android provides the ListView and the ExpandableListView classes which is capable of displaying a scrollable list of items. The ExpandableListView class supports a grouping of items. The input to the list (items in the list) can be arbitrary Java objects. The adapter extracts the correct data from the data object and assigns this data to the views in the row of the ListView. These items are typically called the data model of the list. An adapter can receive data as input. An adapter manages the data model and adapts it to the individual entries in the widget. An adapter extends the BaseAdapter class. Every line in the widget displaying the data consists of a layout which can be as complex as you want. A typical line in a list has an image on the left side and two text lines in the middle as depicted in the following graphic. A layout file for a such a line might look like the following. The adapter would inflate the layout for each row in its getView() method and assign the data to the individual views in the row. Adapters are not only used by ListView, but also by other views which extend AdapterView as, for example, Spinner, GridView, Gallery and StackView. Filtering and sorting of the data is handled by the adapter. You need to implement the logic in your custom adapter implementation. The notifyDataSetChanged() method on the adapter is called if the data has changed or if new data is available. The notifyDataSetInvalidated() method is called if the data is not available anymore. To react to selections in the list, set an OnItemClickListener to your ListView. Android provides default adapter implementations; the most important are ArrayAdapter and CursorAdapter. The ArrayAdapter class can handle a list or array of Java objects as input. Every Java object is mapped to one row. By default, it maps the toString() method of the object to a view in the row layout. You can define the ID of the view in the constructor of the ArrayAdapter otherwise the android.R.id.text1 ID is used as default. You can also directly modify the underlying data structure and call the notifyDataSetChanged() method on the adapter to notify it about the changes in data. If you want to change the data in your adapter, the underlying data structure must support this operation. This is, for example, the case for the ArrayList class, but not for arrays. The following listing shows a layout file called activity_listviewexampleactivity.xml which includes a ListView. The following example shows the usage of the ListView view in an activity. It uses a default layout from the Android platform for the row layout. It also demonstrates the removal of list items and uses animations for the removal. The ArrayAdapter is limited as it supports only the mapping of toString() to one view in the row layout. To control the data assignment and to support several views, you have to create your custom adapter implementation. For this you would extend an existing adapter implementation or subclass the BaseAdapter class directly. Frequently you extend ArrayAdapter to write a custom adapter, as this is simpler than extending BaseAdapter directly. The adapter needs to create a layout for each row of the list. The ListView instance calls the getView() method on the adapter for each data element. In this method the adapter creates the row layout and maps the data to the views in the layout. This root of the layout is typically a ViewGroup (layout manager) and contains several other views , e.g., an ImageView and a TextView. The following graphic shows a list with different layouts for odd and even rows. Within the getView() method you would inflate an XML based layout and then set the content of the individual views based on the Java object for this row. To inflate the XML layout file, you can use the LayoutInflator system service. This layout inflator service can get accessed via the getLayoutInflator() method of the activity or via the context.getSystemService(Context.LAYOUT_INFLATER_SERVICE) method call. After the adapter inflated the layout, it searches for the relevant views in the layout and fills them with the data. The individual elements in the layout can be found via the findViewById() method call on the top level view. The following code shows an implementation of a custom adapter. This adapter assumes that you have two png files (no.png and yes.png) in one of your res/drawable folders. The coding inflates an XML layout file, finds the relevant views in the layout and sets their content based on the input data. The row can also contain views which interact with the underlying data model via the adapter. For example, you can have a Checkbox in your row layout and if the Checkbox is selected, the underlying data is changed. Android provides specialized fragment and activity classes to simplify list handling. The classes are the ListActivity class if you want to use lists in activities and the the ListFragment class if you want to use lists in fragments. You do not have to assign a layout to these elements. If you do not define a layout, the activity or fragment contains a single ListView by default. ListActivity and ListFragment also allow you to override a onListItemClick() method for handling selection of list items. Both classes allow you to set the adapter to the default ListView via the setListAdapter() method. The following example code shows a simple ListFragment implementation. The next example code demonstrates the usage of a ListActivity. You can use a custom layout with ListActivity or ListFragment. In this case the fragment or activity searches in the provided layout for a ListView with the pre-defined android:id attribute set to @android:id/list. This usage is demonstrated by the following code snippet. If you do not use this ID or do not include a ListView into your layout, the application crashes once you try to display the activity or the fragment. You can also use a view with the @android:id/empty ID in your layout. The corresponding activity and fragment shows this view automatically if the ListView is empty and hides it otherwise. For example, you could display an error message in such a view. The following exercise demonstrates how to use a ListView in an ListActivity. You use the predefined ArrayAdapter class and an existing Android layout for the rows. Create a new Android project called de.vogella.android.listactivity with the activity called MyListActivity. Change MyListActivity class based on the the following code example. Note that the setContentView() method is not used. In our example your will define your layout for the rows and use it in your adapter. Create the rowlayout.xml layout file in the res/layout folder of the de.vogella.android.listactivity project. Change your activity so that is using the new layout. The following uses two images “no.png” and “ok.png”. I placed it in the “res/drawable-mdpi” folder. You must create your own icons. In case you do not find any icons just copy “icon.png” and use a drawing program to change it a little bit. Create the class MySimpleArrayAdapter which will serve as our adapter. To use this adapter, change the activity to the following. If you run this example you should get a list with different icons for the certain elements.